One of the most important, must have photographs that I create at every wedding is the traditional glamour head shot of the bride. 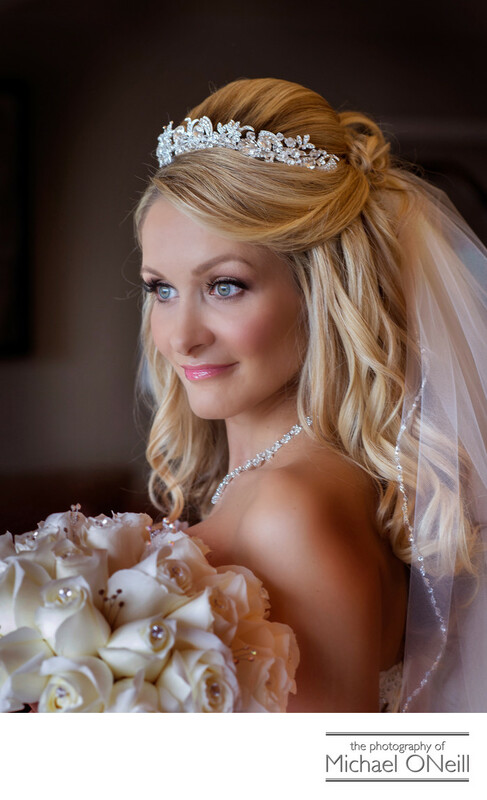 Using beautiful, soft directional lighting yields amazing detail in the bride’s dress and flowers while casting a flattering soft light that illuminates her eyes and face. Some local retouching and enhancement in the computer afterwards renders the bride’s complexion flawless. Great retouching and enhancement techniques are truly a part of the professional wedding photographer’s work product these days. Too many photographers today boast of providing their clients with fully "edited" images. This "editing" usually consists of applying some preset or Photoshop action to your pictures...along the lines of a one press Instagram Action. Globally applying a filter to an image may be considered editing, but it doesn’t constitute fine retouching and enhancement. Simply removing color from an image doesn’t make it a good black & white photograph. You can do that with your smart phone. When researching the perfect photographer for your wedding day be sure to see examples of the kinds of retouching and enhancement techniques he or she will utilize after the wedding day. This "digital darkroom" work is every bit as important these days as the actual capture of the image in the camera. You want to, and deserve to look your absolute best on the biggest day of your life. Make sure your professional wedding photographer has the abilities to make that happen for you.